The integration of automation and data exchange in manufacturing technologies is commonly referred to as Industry 4.0, the forth industrial revolution. 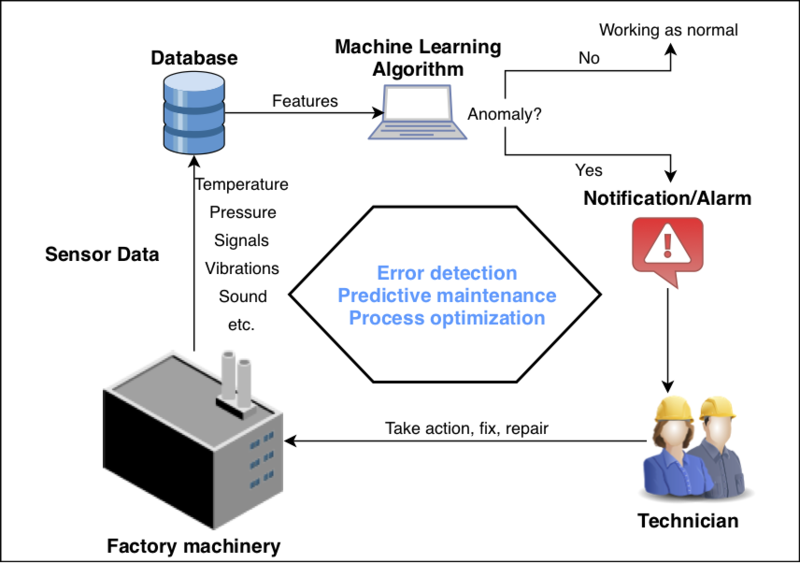 One application case in this industrial revolution is the automated fault detection, or anomaly detection, in industrial processes. Anomalies are by definition rare events, that are deviating from the standard or normal behavior. Due to the amount of time-series data created by industrial machinery, the diversity of processes and the rarity of anomalous events, system that detect anomalies with a threshold based system require an enormous work and time effort to be set up or are prone to miss the desired events. Therefore, a new approach as to be explored. In this thesis, we would like to explore the possibilities of machine learning techniques to detect anomalies in time-series data, that might facilitate the installation of autonomous anomaly detection system, handle the complex interactions of different measurements and the rarity of anomalies by learning the state of normal behavior. L. Rychener and J. Hennebert, “Machine Learning for Anomaly Detection in Time-Series Produced by Industrial Processes,” in FTAL conference on Industrial Applied Data Science, 2018, p. 15–16.